Who is the coolest smuggler in the galaxy? Who drives the fastest ship in the galaxy? Who wins that ship in a card game, trades insults with a princess and has a best friend who's a "walking carpet?" That's right! He's one of the coolest rogues ever to appear on a movie screen--or inside a book! And I've recently read two Han Solo books that you'd really like. 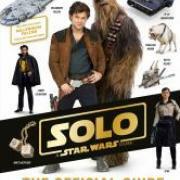 The first is Solo, A Star Wars Story: The Official Guide by Pablo Hidalgo. OK, let me ask--did you enjoy the Solo movie? I bet you did! What's there not to like? It's the perfect GUY movie--battle sc enes, a train robbery, fast escapes on speeding cruisers, fast escapes on speeding spaceships, lots of people wearing blasters and plenty of chances for things to blow up. Plus a few laughs. Yeah, what GUY wouldn't love a movie like that? Where you could find coaxium. What's the deal with Dryden Vos and those stripes on his face? Where Millenium Falcon came from and what makes it so unique. Plus you get a great cutaway view of the interior of the Millennium Falcon, a map of the Kessel Run along with a Guide to the Galaxy. All this makes for a very interesting read. Spend some time with this one, guys! The second is Star Wars: Han Solo by Marjorie Liu and illustrated by Mark Brooks, Dexter Vines,Sonia Oback and Matt Milla. It's a graphic novel and, man, it's one of the best I've read in a long time! Exciting, thrilling, suspenseful and a touch of awesome wonder at the end--this story is all those things and more. A lot happens in this story, so I'll be brief. Han gets recruited by Leia to travel to a far corner of the galaxy to pick up three informants. The Rebellion can't do it because there's a mole and they can't use any of their own ships without arousing suspicion. They need someone like Han who would have a good reason to be in that system--and that reason would be the Dragon Void Run, "One of the most notorious, dangerous races in the galaxy" and every pilot's dream. Han agrees and enters the race. (he'll pick up each informant at one of the three required refueling stops) But danger starts almost immediately. The race is incredibly hazardous on its own. Then the Empire shows up and starts shooting at the racers. (are they on to Han's mission?) Then one of the informants is murdered--is someone a traitor? Oh, man, this action is nonstop! It's a great graphic novel with the perfect combination of story and artwork. Plus there's there's an unforgettable character, Loo Re Anno, whose ship is as old as some stars! Her presence brings a sense of wonder to this story, which is what the best sci-fi does. OK, these are really fun and you'll enjoy them. Go check them out! "Yes, check them out you must." Are you going to argue with YODA? Go check them out!